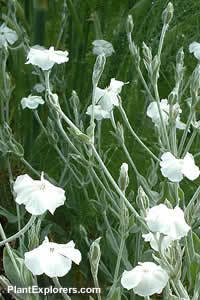 This white form of Rose Campion comes reliably true from seed and makes an attractive accent in any garden. This erect, wooly silver-gray plant produces a succession of long-stalked white flowers from late spring through the summer and into the early autumn. This biennial reseeds itself reliably, and may survive as a short-lived perennial. Height 32 inches; spread 18 inches. For maximum freshness, please keep seed refrigerated in its original packaging until it is time to plant. Sow seed in situ in spring, or start in containers in a cold frame. Grow in any good garden soil with reasonable drainage in full sun or light dappled shade.